Whether you plan to stroll on a beach, linger poolside, picnic at the lake, or sail off shore, Aurorae's oversized super absorbent towels are light weight and compact. These microfiber, eco-friendly towels are perfect for sport and fitness, leisure or relaxation. I took this towel to the lake and my family said over and over again how nice it was. I was worried that it wouldn't dry us off very well being microfiber, but it worked very well. This definitely a spa quality towel. We have a few beach towels, but they are all for the kids. It is nice to have a luxurious, quality towel that mama can take to the beach, pool, or lake! 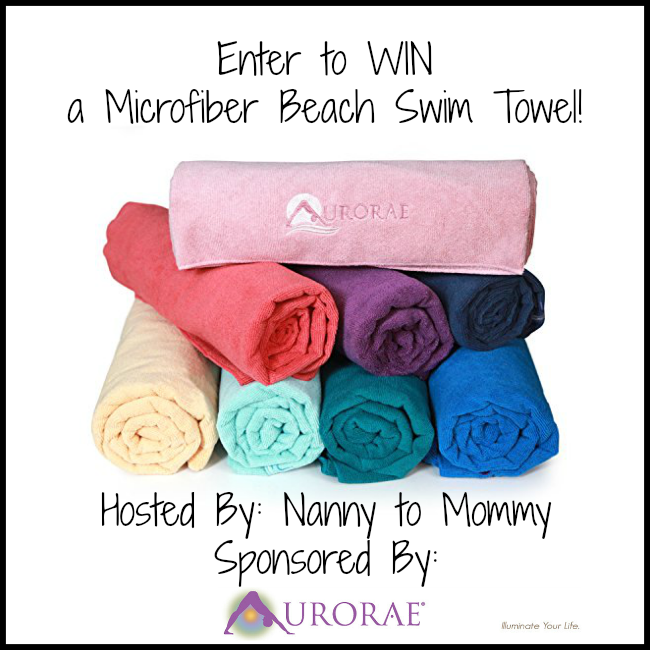 One winner will receive a Sport And Swim Towel by Aurorae Aqua in choice of color! RV $34.99, Buy Now on Amazon for only $24.99! Open to US only, must be 18+ to enter. One entrant per household. ALL winning entries are verified. Good Luck! 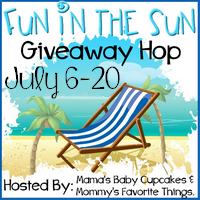 Welcome to the Fun in the Sun Giveaway Hop hosted by Heather from Mommy's Favorite Things and Michelle from Mama's Baby Cupcakes. This hop is focused on items you'd want/need for outdoors and the Summer time! Each blog has a minimum prize package of $25 per winner and after visiting my giveaway, make sure you use the linky below to take a look at the other blogs to see what they have to offer for you! 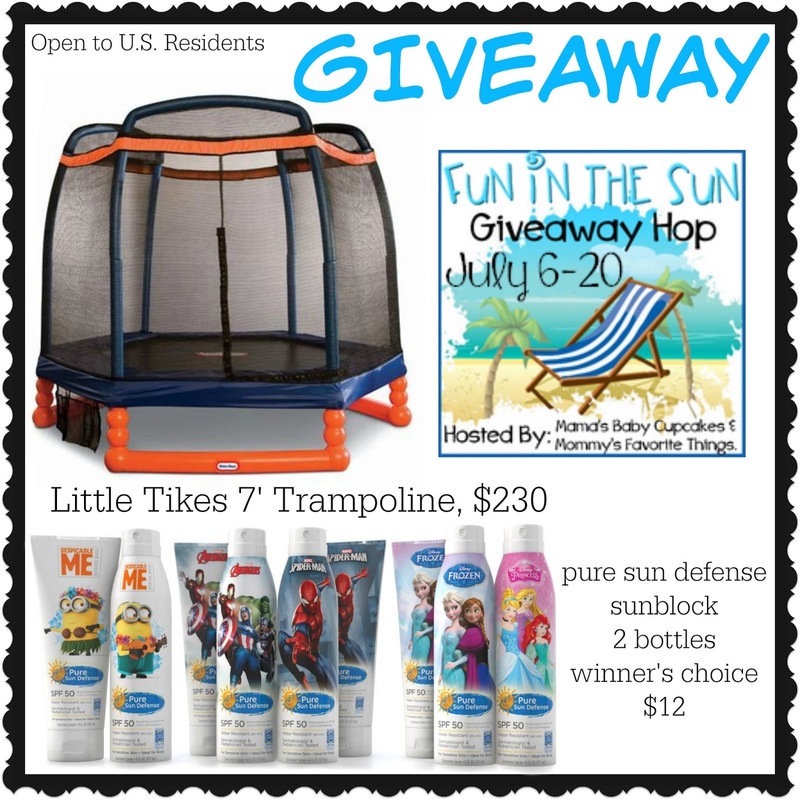 Don't forget to enter the Grand Prize hosted by Mama's Baby Cupcakes for your chance win a Little Tikes Trampoline and your choice of two bottles of Pure Sun Defense kids' sunblock. Two things that are perfect for the Summer! 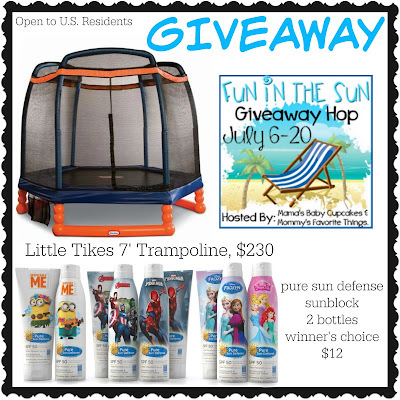 You can read Michelle's full Little Tikes review here, and then her Pure Sun Defense sunblock review here. Mama's Baby Cupcakes, Mommy's Favorite Things and the "Fun in the Sun" participating bloggers are not responsible for sponsors who do not fulfill prize obligations. I'd choose Mediterranean Seas, and I'd take it to the beach and on our camping trip. We will be visiting my brother and his family in Florida next month. I would take this towel to the beach. The color choices are beautiful and my favorite is Mediterranean Seas. We are planning on going to the beach in FL this month! I'd definitely use this while at the beach. My favorite color is the Caribbean Breeze. I am planning on a visit to the beach and six flags. We are staying home and hitting some of the local attractions. We have a state park with a beautiful beach right in our tiny town. We have only been there for parties in the 9 years we have lived here, that is just crazy. I'd take this towel to my daughter's backyard and play in the sprinkler with the kids. I'd choose coral. If I was the lucky winner, I would pick the color Kauai Coast!! We are hoping to get to the Cape this summer and I would bring this towel to the beach! I would choose the Cayman Island Coral. My family goes to the pool nearly everyday, so this would be really handy for my family. I like the blue ones. Would take on short weekend trips. I would choose the Cayman Island Coral if I won. We just go swimming at home and sometimes at a family members house. We are going to visit our son and his family. We will be going to the pool quite often with the grand children so this would come in handy. I would pick the Kauai Coast color. I like the Carribbean Breeze Color. I would take this to Bodega Bay when we go with the grandkids. We've already been to the beach so I'd like to take the Caribbean Breeze color to the pool. I love the Kauai Coast color. My Summer plans are to do lots of hiking and lots of relaxing on the beach!! This towell would really come in handy for that!! I would choose Mediterranean seas!! I like the Carribbean Breeze Color. I would take it to the casino. I'm currently getting ready for college and I would so take this towel to Austin. I would take this to my neighborhood pool. I think I like the Fiji Sunset purple color best. My summer plans are to have as much fun as possible! My plans are to spend the nearly every day at the beach and I'd bring the towel with me and I'd go with purple. We are going on a trip with our churches youth group to an aquarium and museum. We are staying in a hotel with a pool so the towel would be handy then. I would choose Kauai coast color. I'm excited about the arrival of my 2nd grandson in August. I would take this with me when I go to the pool with my 1st grandson. I would choose the Kauai Coast color. My Summer plans are to stay home and watch movies, tv series on Netflix. I would choose Fiji Sunset. My summer plans are to relax at home before the new school year starts. I would love to use this towel by the pool, looks nice and soft. I would choose Mediterranean Seas. I love this in Mediterranean Seas. This summer I hope to spend most of my time swimming, having fun outside, BBQing and enjoying bonfires with my family. We have alot of road trips planned. This will be useful on the trips. I would like the Pacific Twilight. i don't really hae any plans except for reading. Maybe i'll go to the beach . My grandkids are coming at the end of the month, and I would probably use this around our pool. I like a lot of the colors especially the Mediterranean Seas. My summer plans include spending as much time out on the water as possible, whether on our boat, out on the kayaks, or just at the beach. I would take this towel with me to all of those places. I really like all of the colors, but I think my favorite is Kauai Coast. I would choose either the purple or the teal blue colored towels. I would let my grandson use this towel at the pool because the towel looks very soft. Nothing super fancy plans this summer. I am hoping we can take a family trip down to Savannah, since it's about 3 hrs away, give or take. Plus, the fresh seafood, mhmmm! The pacific twillight towel will come in handy if we stop by the beach or even go to the pool or White Water. We are going camping, swimming and fishing. I like the Kauai Coast. I would take it to the beach and I like the Mediterranean Seas. I have been working all summer. I would choose purple and I would use it at the beach. I do not have any plans. I would love the Fiji Sunset purple one. I love it because purple is my favorite color. We're remodeling our new house! But we'll still squeeze in some beach time! I'd choose the Caribbean Breeze towel! I'd pick Mediterranean Seas and would take it to Oceans of Fun. My kids love to go there so we try to go a couple of times during the summer. We don't have any major summer plans, just enjoying the nice weather. I would like to take this towel to the beach sometime this summer though. I like the Kauai Coast color the best! would take it to the pool.I like the Bermuda Sands color the best. I would pick the Kauai Coast for my color and use it at our pool because that's pretty much what we're doing this summer. Our big summer plans is taking kids to st. louis zoo and children's museum sometime soon. I would love to have the Mediterranean Seas towel. i'd take to edinboro lake. i don't have solid summer plans because i just started my job & have to "earn" my vacation time :( i like the kauai coast color of the towels! I would take this towel with us to the amusement park in a few weeks! We easily spend half the day on the water side!